Lifelike electric flame - FlameWave lets you have the cozy and inviting visual warmth of a flame with the safety of a light bulb. 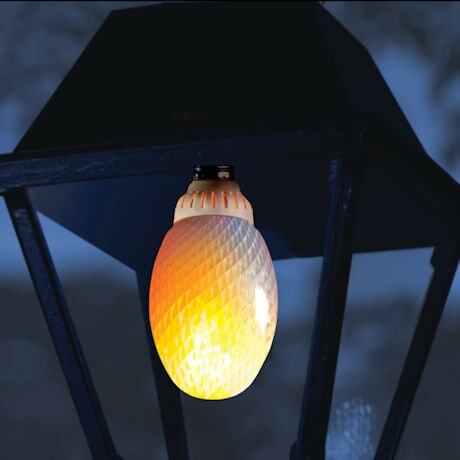 The lifelike color, clarity, and flickering motion of the FlameWave bulb provide the warmth and light of a natural flame - without the hazard and smoke of fire. 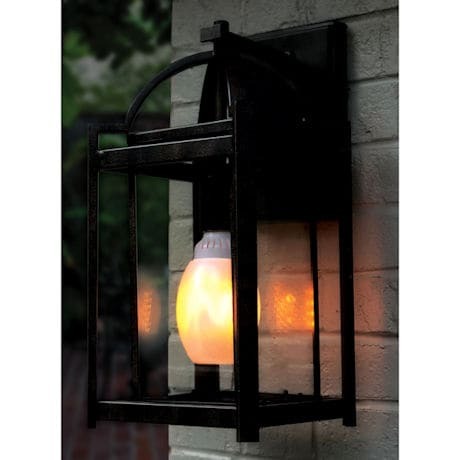 Outdoor use - Flamewave is the perfect way to give your home some charming and unique street appeal as it turns your outdoor lamp post or garage lights into flickering gaslights. The weather-resistant bulb is designed to stand up to cold and condensation. Gaslight look - Comes with a diffuser cover to give the light a convincing gaslight look. This ceiling-bulb model simulates a flame from top to bottom so you can get the effect while hanging it upside-down from ceiling fixtures. Three modes let you choose from live flame effect, breathing mode (goes from light to dim every 3-to-5 seconds), and a general continuous-lighting mode. Measurements - Cylinder-shaped bulb measures 4.25" high and 2" in diameter. Surrounding egg-shaped diffuser measures 4.5" high and 3.5" in diameter at its widest point. Light and diffuser together measure 5.5" high. Easy to use - Screws into any standard electric light bulb socket. In the time it takes to change a light bulb, you can convert your outdoor lamp post, indoor floor lamp, ceiling light, or any other light fixture into a simulated flame. E26/E27 Base compatible. AC100V-245V, 50/60Hz. 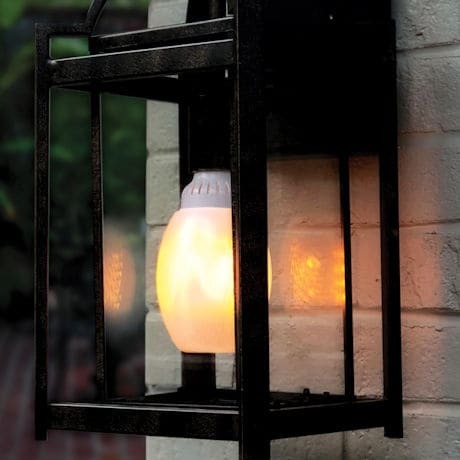 REALISTIC ELECTRIC FLICKERING FLAME - Give your space the mood lighting of a flickering flame without the fire hazard. 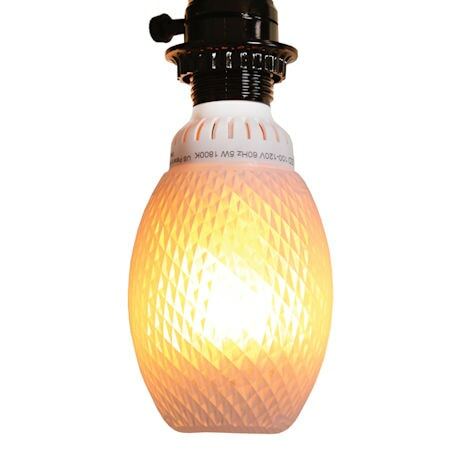 By simply replacing your standard light bulb with this flame-simulating bulb, you can turn your indoor or outdoor light into an authentic-looking gaslight flame. TOP TO BOTTOM FLAME MOVEMENT - Meant to be hung upside down, flame flickers from top of bulb to the bottom to give the illusion of a candle hanging from your ceiling. COMES WITH OUR EXCLUSIVE DETACHABLE DIFFUSER - Other electric flame bulbs need to be installed behind a shade or opaque glass to simulate a flame. 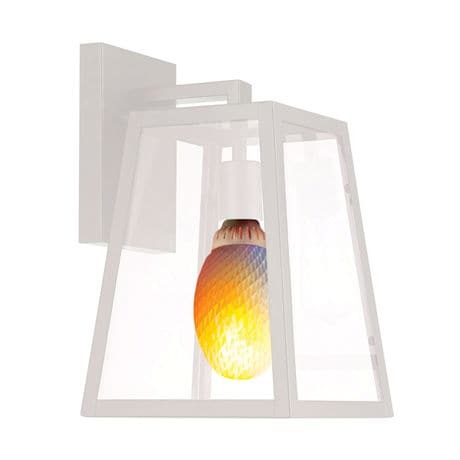 The FlameWave bulb comes with a removable diffuser cover, so you get the BEST effect when you install it in clear glass fixtures such as in outdoor lamp posts. 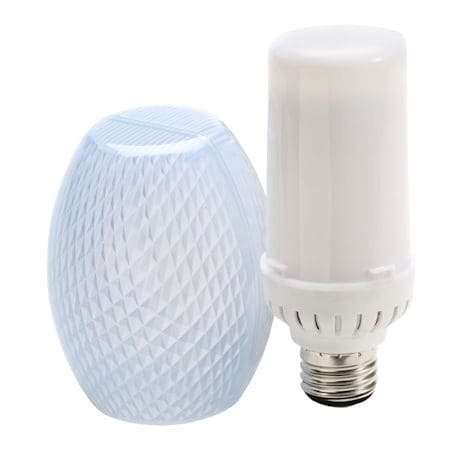 Fits in most light fixtures, the light and diffuser together measure 5.5" high AND 3.5" in diameter. Light bulb alone measures 4.25" high and 2" in diameter. 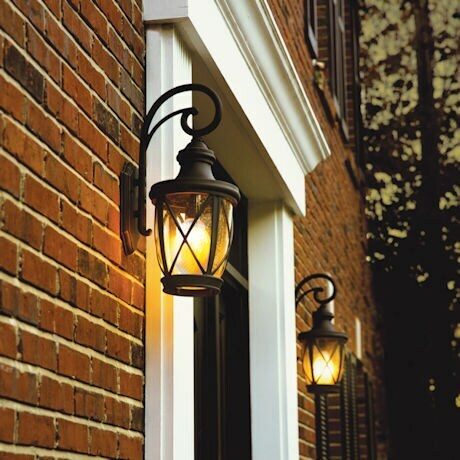 PERFECT FOR OUTDOOR USE - A great way to spruce up your home's exterior by turning your garage light or lamp post into a gaslight, and it's as easy as simply changing a light bulb. Leave it out in all seasons, bulb is cold and moisture resistant, but must be shielded from rain and snow. 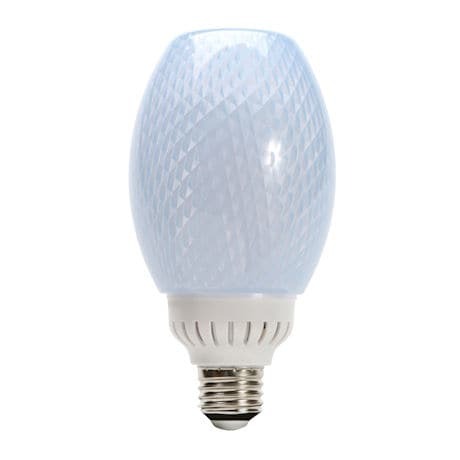 SOFT, ENERGY-SAVING ILLUMINATION - The FlameWave bulb features 3.5 Watt LED lights that go easy on your electric bill, while creating a soft glow designed for ambiance and decorative lighting. The lights emits an exact 1300K color, a shade of red very close to true fire. Customer satisfaction guaranteed.